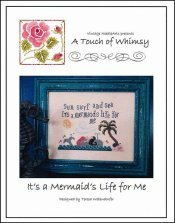 It's A Mermaid Life For Me [D6642] - $10.00 : Yarn Tree, Your wholesale source for cross stitch supplies. A cross stitch pattern from Vintage NeedleArts. Make a splash this summer! Baking in the sun, mermaid lays on the whales back, soaking up the sun. A little bird sits on the beach, watching as his buddy stands on the tail of the whale. "Sun surf and sea. It's a mermaids life for me!" Stitch count is 107W x 79H.